This 10" Slatwall Hook will help maximize your wall space, providing you with ample room to create neat and organized displays. The 10" hook is great for medium to large size items, or a large quantity of smaller items. 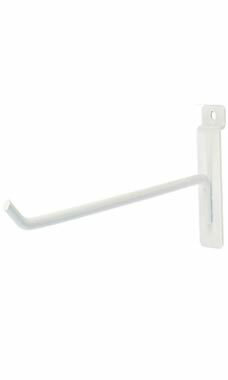 The sleek white finish on this hook looks great, as it matches any color slatwall, without distracting customers from the items on display. At the lowest price guaranteed, these 10" hooks are a must have for any retailer! In stock and available for immediate shipment. Strong and supports most items. Overall good quality and finish.